Try us out. Your bike will thank you! 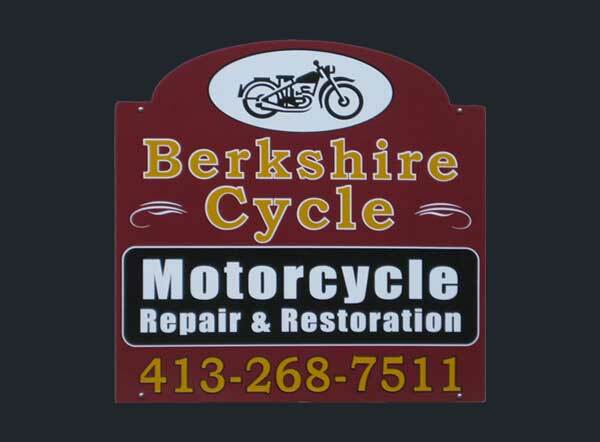 Berkshire Cycle For All Your Motorcycle Needs. For whatever your bike needs, bring it to people that love motorcycles as much as you do. We´re a bit off the beaten path, but our customers feel that we´re worth the ride. You should at least try us out! Stop by for an oil change. Check out the bikes. Check out the vibes. You´ll be back! Over 30 years repairing & restoring every brand of bike there is. Factory trained & certified by multiple manufacturers. For those hard to find parts, we know a guy that knows a guy. Our low overhead lets us charge less than the fancy places. We´re fully insured and sleep 20 feet from your bike. Your bike is the most important bike in our shop. Berkshire Cycle is a full service repair shop able to handle any job large or small. We enjoy working on all brands including ATV's and scooters. Our team has a passion for vintage bikes and we have a lot of experience on 60´s Japanese and British makes. We can rebuild your 1966 Honda 305 scrambler or restore your 1971 Norton commando. If you call for advice or help in finding a part you will always get a friendly voice on the other end helping you in any way we can. Some of our customers just stop by to say hi and to see the bikes we are working on that week. Call or stop by anytime during our business hours. Brad has been working as a mechanic since 1975 on both cars and motorcycles. His true passion is motorcycles, so he started his own part time repair business in 1995. Thanks to repeat customers and referrals over the years we have grown our business and expanded our hours of operation. In 2004 we moved the family and business to Goshen and built a bigger and better repair shop to better serve our customers. Brad is shop owner and mechanic so you always get professional and personal service. In 2014 Brad's stepson Adam joined Berkshire Cycle as a motorcycle dealer trained mechanic, what a great team they make. Brad and Adam also share a passion for vintage bikes of all makes and have become active in local Moto-Giro and VJMC (Vintage Japanese Motorcycle Club) activities. We can bring your pile of parts back to rideable or show condition. We´ll take on the the toughest repair and guarantee your complete satisfaction. We are a licensed Massachusetts Inspection Station. Preventive maintenance can go a long way towards happy ownership.